What do the jobs of opera singer, lawyer and science fiction writer have in common? She then went to law school and worked for several years as a lawyer. Unfortunately, “I loved the law but I didn’t love lawyers,” she explains in my interview with her on New Books in Science Fiction. Her first science fiction novels, the Circuit Trilogy, drew on her knowledge of the law as she chronicled the adventures of a federal court judge riding circuit in the solar system. She also collaborated with George R.R. Martin to create the shared world series Wild Cards. It was Martin who encouraged her to write a spec script for Star Trek: The Next Generation. That spec script, inspired by the Dred Scott decision, turned into the episode The Measure of a Man, and a job as story editor for the series. 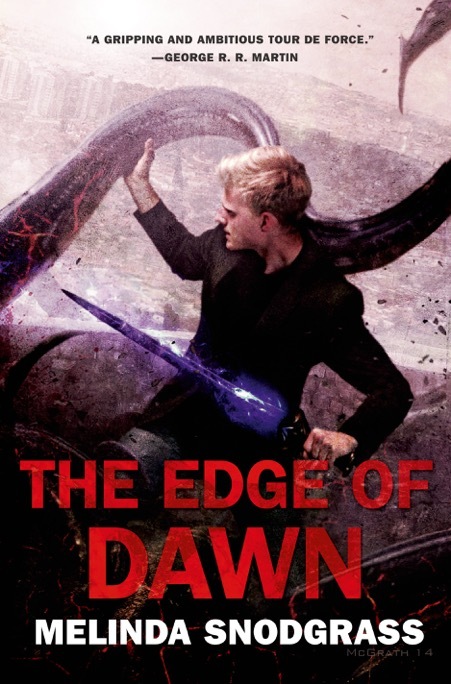 Her newest contribution to science fiction is Edge of Dawn, the third book in the saga of Richard Oort, who leads a team seeking to destroy beings from an alternate dimension that use religion to create strife on earth. The trilogy is in large part a battle between science and religion. “Science is all about doubt. It’s about saying, ‘is this real and how can I test it?’ … Religion is about the opposite thing entirely. It’s about faith and acceptance of it without questioning, and I think that that can lead to very dangerous results and outcomes,” Snodgrass says.